President Obama on Friday announced his nomination of Ashton B. Carter, a physicist and former deputy defense secretary, to replace Chuck Hagel as defense secretary. 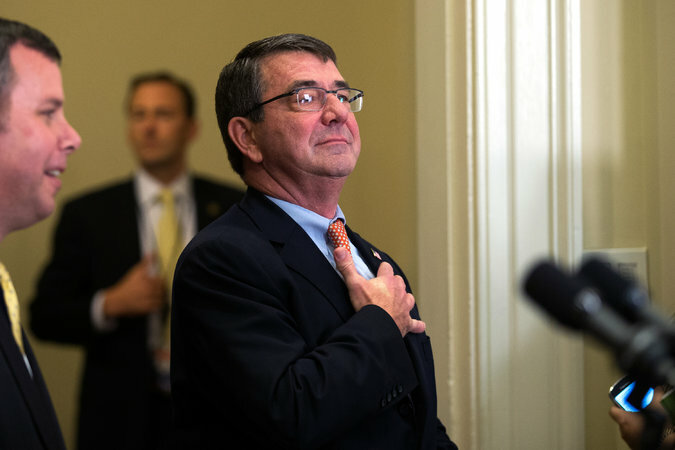 WASHINGTON — Ashton B. Carter, the physicist nominated by President Obama on Friday to lead the Pentagon, is in the mold of past cabinet secretaries who have tangled with the White House and may advocate a stronger use of American power overseas. Assertive and intellectual, Mr. Carter, 60, is in many ways the flip side of Chuck Hagel, the current defense secretary, who was seen as passive and who submitted his resignation under pressure last week. Mr. Carter is more like Robert M. Gates, Mr. Obama’s first defense secretary, who stood up to the White House. The two men are in close touch, and both have a jaundiced view of Washington. Mr. Hagel had been expected to appear alongside Mr. Carter, his former deputy, at the White House announcement on Friday, but he was a surprise no-show and instead issued a statement that it was Mr. Carter’s day. His absence reflected his chilly relations with members of Mr. Obama’s national security staff, who described him as largely silent during cabinet meetings, although he also irritated them when he sent a memo to Susan E. Rice, the national security adviser, questioning the administration’s Syria policy. If Mr. Carter ends up to the right of Mr. Obama on Syria and the fight against the Islamic State, it will not be the first time. Former aides and administration officials say that Mr. Carter — like Mr. Hagel and Secretary of State John Kerry — was shocked last year when Mr. Obama, after a walk and talk on the South Lawn of the White House with Mr. McDonough, decided at the last moment to call off military strikes against the Syrian president, Bashar al-Assad, who had charged across Mr. Obama’s own “red line” on the use of chemical weapons. Now, Mr. Carter will inherit a military strategy that has made some progress in reversing the gains of the Islamic State in Iraq, but has made dealing with Mr. Assad a less important issue. Despite public shows of solidarity, the United States and its partners cannot agree whether their primary enemy in Syria is the Sunni militant group or Mr. Assad. Ashton B. Carter, a theoretical physicist and former deputy defense secretary, is President Obama’s choice to be the next defense secretary. Mr. Carter must also deal with an era of mandatory across-the-board cuts in military spending. “The biggest issue right now is the budget,” said Jeremy B. Bash, a former chief of staff to Leon Panetta, another Obama defense secretary, who is advising Mr. Carter on his nomination. Mr. Carter is expected to have smooth confirmation hearings from Senate Republicans, who say they foresee no opposition to him. Born in Philadelphia, Mr. Carter studied medieval history at Yale and earned a doctorate in theoretical physics at Oxford, where he was a Rhodes scholar. In a 2013 interview, he recalled spending time on “charmed quarks and also the Higgs boson” elementary particle. But then he developed a fascination with defense policy so strong he never pursued a career as a physicist. “In Ash you have a poster child for the guy who discovers that science and technology are the major drivers for some of the most important events in international affairs, and sometimes are the sources of the solutions,” said Graham Allison, who recruited Mr. Carter in the early 1980s to come to the Belfer Center for Science and International Affairs at Harvard’s Kennedy School. “Here was a guy with a physics background who was fascinated by ballistic missile defense. Mr. Carter spent the better part of the next quarter-century at the Belfer Center, though he took a leave during the Clinton administration to work for Mr. Perry, a like-minded mathematician and engineer who became defense secretary at a critical moment, after the collapse of the Soviet Union. He quickly became a central player in the 1994 nuclear crisis with North Korea, when the country threw out international inspectors and began what turned out to be a long and successful drive to develop a small nuclear arsenal. “It may have been the closest we came to conflict with North Korea since the end of the Korean War,” Mr. Carter once said. When Mr. Carter was deputy defense secretary, congressional aides recall numerous hearings when Mr. Carter, testifying alongside military commanders and even his bosses, inserted his own answers to questions not directed at him, to make sure he got his point across. “He is not somebody who can simply be counted on,” said Anthony H. Cordesman, a national security expert with the Center for Strategic and International Studies. “He will say what he thinks."